This graphic shows regions on the fringe of our solar system as it moves through interstellar space. The termination shock is where the solar wind first runs up against the pressure of the interstellar medium. The bow shock is where the solar wind gives way to interstellar influence. 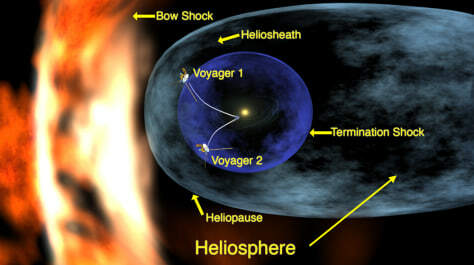 Voyager is now in a boundary region called the heliosheath.